Yesterday was the big Sprint Showdown. 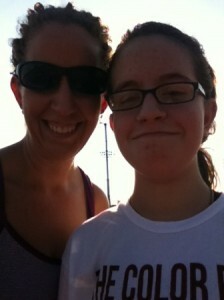 It started with me asking The Kid if she would time my sprints and then she said she would do them with me. Woohoo! We started discussing who would be the faster runner. The young one or the old one. The one with longer, slower legs or the one with shorter, faster legs. Endurance or speed. We hit the track yesterday after work for the event. The Kid showed me the starting mark and pointed around the track to the ending point for 100 meters. I counted down the start of each sprint. We started from a standing position since I figured I didn’t need the disadvantage of hauling myself up from the ground to run. 1 -2 -3 – GO! We sprinted as fast as we could for 100 meters and walked back to the start. The Kid severely beat me for FIVE sprints! I tried. I ran as fast as I could. It wasn’t even close. After the third round of beating, she even announced that she was the slowest in her class. I’m in really good shape but clearly I have no speed whatsoever. Next time I need to actually time my 100 meter sprints so I can figure out if I’m improving or not. Now I’m wondering. Does practice make you faster? Or is it just genetics that determines your speed? Hmmm. Yep, I definitely think you all are safe in a Zombie Apocalypse. I’m getting eaten first for sure since I won’t be outrunning them. Have you tried racing your kids? What were your results?